Kingston, Jamaica (MPR Consulting) - It was long anticipated by reggae and dancehall fans to witness the return of international recording artist I-Octane to Jamaica's premiere and largest concert festival Reggae Sumfest. Noticeably absent to last year's staging, I-Octane was himself busy putting the finishes touches on his third full length album "Love & Life". A fan favorite, the prolific artist made up for lost time by delivering classic hits such as "Mama You Alone" and "Lose A Friend" , to music from his top charting billboard "Love & Life" album like "Weh Di Fire Gone" and "Unfair Games" featuring Yanique Di Curvy Diva who to the delight of patrons made an appearance on the coveted stage. 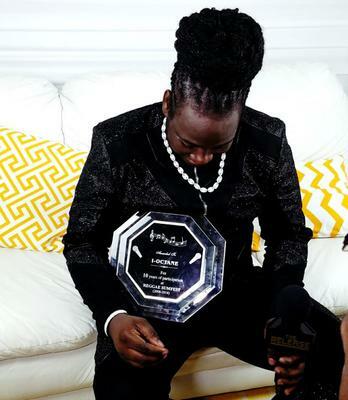 I-Octane's relationship with his fans are meaningful and special to the artist who is well known to leave the safety of the stage to make his way into the core of the crowd for a more intimate delivery. Through Reggae Sumfest live stream, social media overwhelming positive feedback was captured. "Him shell dung d place! hot ras - @cooliecool." "Iconic!!!!!! - @prince_rikardo_elite" "Congratulations loved the performance - @hisqueen.angel", "@realioctane u deallllllll with it WELLLLLL me a tell u - @kimmieluvsu", "Energy him a feel and a connection wid di fans - @king_anthonythefirst". fortunate to be at Reggae Sumfest 2010 when I-Octane made the transition from opening act to headliner status. In his prime-time position that night he tore down the stage with a ferocious delivery of reality lyrics and ever since, he’s been a powerful force in dancehall. I’ve seen I-Octane at every Sumfest since: the years he’s closed the show when others said he couldn’t do it, he not only proved them wrong, he set the stage ablaze! After being benched for inexplicable reasons in 2017, this year’s performance was on another level. Leaping from the stage to deliver the majority of his set standing on a barrel in the middle of an audience exceeding 10,000 patrons, Octane put down furious, adrenaline pumping renditions of his hits.